Der Artikel Riot: Restless (Collector's Edition) (Remastered & Reloaded) wurde in den Warenkorb gelegt. 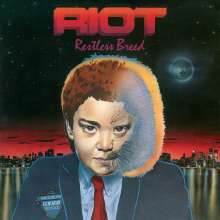 Special Deluxe Collector’s Edition / Fully Remastered Audio / One of the best North American mid ‘80s hard rock bands / 12 page full colour booklet – 3, 500 word essay, enhanced artwork, rarely seen photos and new interview - THIS WAS Riot’s 4th album. It followed a period of intense activity both physical and emotional, having survived a series of knockbacks over the years that would have decimated lesser contenders. The fact that they had recently survived several line-up changes, an underfunded UK tour supporting Sammy Hagar and bagged a spot on the 1st Monsters Of Rock festival was a minor miracle. With interest building amongst grass roots fans the future was actually beginning to look bright. That was until frontman Guy Speranza made a decision to leave the band. Fatigued by years of touring and (literally) banging his head against a brick wall, he moved aside for Rhett Forester, a man seen as a golden ticket to bigger and better things. Now signed to Elektra Records, the band once again retreated to their management’s downtown New York studio to craft ‘Restless Breed’, a record that although well received in their circles, edged the band slightly towards the centre ground. It was less the full-on NWOBHM - inspired frenetic energy of their previous records and more disposed towards power metal. Still led by guitarist Mark Reale, this record was in many respects hamstrung by a new label who really didn’t know how to market their kind of act. Previous releases had benefitted from the band’s resourceful managers and an ability to connect with an underground fan base, but this time around they were left constrained by a label that refused to support them on tour that were dropping the promotional ball at every turn. Still, hats off to the band for crafting another album that still impresses to this day.